Creative professionals can learn some of the best ideas through another experienced person. Udemy is a popular online web application for studying offbeat topics by well-educated teachers. You are given a series of video courses which you can study, along with external links provided for research. Larger topics are often broken down into sections which contain full sets of video lectures. One of these courses delves into the idea of starting your own web design company with a lot of helpful resources. The professor explains how to get started and some common pitfalls which newcomers often fall into. This course is an excellent idea for anybody thinking about becoming a professional web designer or founding their own design studio. No matter what age or how much experience you have, the business of running a design agency is much more complicated than freelancing. 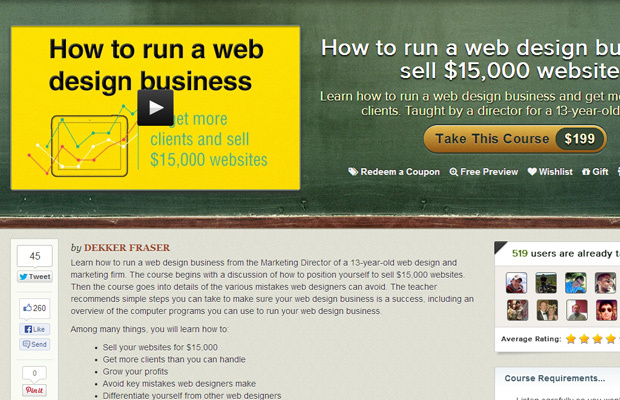 The pitch is that you’re learning how to create a premier web design agency from scratch. You should be able to offer websites for $10k-$15k a piece, which includes the design and coding. Maybe you’ll choose to work with larger corporate clients, or government contracts, or creative professionals in music or film. There are so many niches out there and you just need to find what suits your design talents the best. Another key aspect to this video course is the business side of things. You’ll need to understand time management, financial statements, customer relations, and possibly even management over employees or contractors. It is a big step going into business with your own skills. But if you are confident and willing to learn then you’ll know if it’s the right thing to do. The great part about Udemy is that instructors can setup their own materials for the courses. So you will have downloadable assets to help you get through some of the detailed lectures. And the whole course is 100% refundable within a 30-day period. So even if you’re hesitant there isn’t much to lose by trying it out for a week – if running your own web design company eventually feels like a mistake just get a full refund on the course. If you are interested about what others said try reading through some user reviews of the video course. Not everyone left a comment so the reviews can only be so helpful. But if you have even an inkling of interest in this concept, try it out and see what you think. There is a lot of great content in these lectures which can help designers avoid the most common mistakes that often derail other web design businesses.